According to a criminal complaint, Gregory Rodvelt, in a photo provided by the Surprise Police Department in Arizona from a separate incident, told law enforcement "I would not race right in" to the booby-trapped home. Sixty-seven-year-old Gregory Lee Rodvelt, the man who used to live at this home in Williams, Ore., has been charged with assaulting a federal officer. And before the highly trained team even entered the house, it encountered a series of traps that are straight out of the adventures of Indiana Jones. This started on Aug. 22, when a judge in Josephine County appointed attorney Joseph Charter to take possession of the property where Rodvelt resided in order to sell it. According to the criminal complaint, Charter asked authorities from the FBI and Oregon State Police to clear the property. He had reason to think it might be unsafe. Rodvelt had previously been charged with unlawful possession of explosives but was released to attend the property hearing. Several days prior to the judge's order, neighbors had seen Rodvelt at the property. There was another, more direct warning: Charter told the authorities that he spotted a sign "warning that the property was protected by improvised devices." As authorities approached the property on Sept. 7, the first obstacle they encountered was a minivan blocking the front gate. "The technicians discovered that the minivan was rigged with two booby traps," the complaint states. "The booby traps utilized steel traps with steel teeth commonly used to trap wild animals." After they neutralized those traps, another obstacle awaited just beyond them — a round hot tub, propped on its side. "Upon close examination, the technicians discovered that the spa was rigged in such a manner that when the gate was opened it would activate a mechanical trigger that would cause the spa to roll toward the person at the gate much like the scene from the movie 'Indiana Jones – Raiders of the Lost Ark' in which actor Harrison Ford is forced to outrun a giant stone boulder he inadvertently triggered by a booby trap switch," the complaint states. In the property's garage, the officials also found the apparent makings of a booby trap that was not rigged. It involved a rat trap that would cause a shotgun shell to deploy when the door was opened. At this point, they moved on to the main house. They used an explosive charge to get through the front door. That's when they spotted a suspicious fishing line behind the door. Several of the specialists entered the residence, where a wheelchair was positioned in front of them. Suddenly, there was an explosion as the wheelchair was moved forward. According to the documents, it's not clear how that happened. But an FBI agent apparently yelled "I'm hit!" as a "significant amount of blood" poured from his leg. The agent was rushed to a hospital, and an "unknown object" that "appeared to be shaped like a small pellet" was removed from his leg, the complaint states. A later search of the property uncovered a spent shotgun shell casing, believed to be from the device that injured the agent. 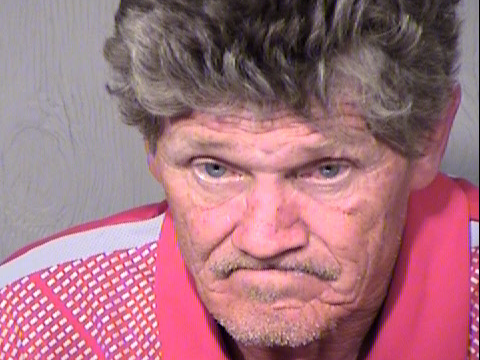 FBI agents found Rodvelt in Arizona, where during an interview he allegedly said he set up the hot tub trap and discussed other tripwires on the property. When asked about other threats there, the complaint says that Rodvelt stated, "I would not race right in." No lawyer for Rodvelt is listed in court documents reviewed by NPR. Rodvelt also lost an elder-abuse lawsuit brought against him in the same county. As The Oregonian reported, "In 2016, Rodvelt's then 90-year-old mother and her guardian filed a civil lawsuit in Josephine County, which resulted in a $2.1 million judgment, against the son, court records show."